About the only reason I go to McDonald's now, is to get a large Diet Coke when I'm headed to work. I've finally trained the store that's closest to me to not give me a straw, although sometimes they forget. I imagine we'll be going back to paper straws due to plastic being bad for the environment. 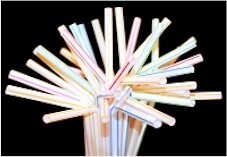 Actually, couldn't we just skip straws altogether? ?